For several years as a child, I was convinced that I would be an astronaut when I grew up. I loved everything having to do with space and rockets; I collected photographs and magazines about space travel; I begged my parents to take me to the National Air and Space Museum in Washington, D.C. when it opened in 1976; and of course I also watched Star Trek reruns religiously. There simply could be no other occupation worth pursuing, and nothing could dissuade me from my passionate desire to go into space. Well, maybe one thing. I was watching the TV coverage of a space launch that followed the astronauts through all the preparations they underwent leading up to the mission. And before they got into the rocket, a doctor gave them shots of some kind. I couldn’t believe my eyes. Injections? Just to go into space? No way. I’d have to find a safer profession. And from that very moment I knew I’d never be an astronaut. Although my dream of traveling into space had met an untimely end, I was still happy to watch other people do it, and I was particularly interested in the paraphernalia of space flight—the spacesuits, computers, freeze-dried meals, and so on. One day I was leafing through a catalog and I saw something that made my jaw drop: the Fisher Space Pen. “Just like the astronauts use!” it said. I was already drinking Tang, so that became my next object of desire. This pen, so the catalog said, would write in zero gravity—and, as a bonus, it could also write upside down, underwater, in a vacuum, on glossy paper, in extremely hot or cold environments, or even on greasy surfaces. And it was so shiny and futuristic-looking. Wow. I had to have one. “We have plenty of pens,” my parents said. Which was true. The problem, of course, was that the Fisher Space Pen was quite a bit more expensive than your basic disposable Bic. “But they don’t write in zero gravity!” I complained. My parents, ever pragmatic about such matters, then inquired when I expected to encounter zero gravity. I had to admit that was unlikely. After further discussion, I also conceded that I would probably have no need to autograph greasy, glossy photos while standing on my head underwater. So even the scaled-back dream of merely writing with the same pen the astronauts used evaporated. Many years later, having all but forgotten this episode, I received a Space Pen as a gift. I was absolutely giddy with excitement. It didn’t matter that it had cost only US$20. I couldn’t believe I was actually the proud owner of something I’d always believed I could never have. It was, for some time, my Favorite Thing Ever. And yes, it performed flawlessly—just as advertised. I never encountered a surface or angle it couldn’t handle. Long ago, I read a story that the Space Pen had cost NASA a fortune to develop. According to the story, when a U.S. astronaut asked a cosmonaut how they’d ever managed without one, the simple reply was, “We use pencils.” Although I can certainly imagine that NASA has, over the years, wasted huge sums of money engineering their way around problems that could have been solved with common sense, this particular story turns out to be false. 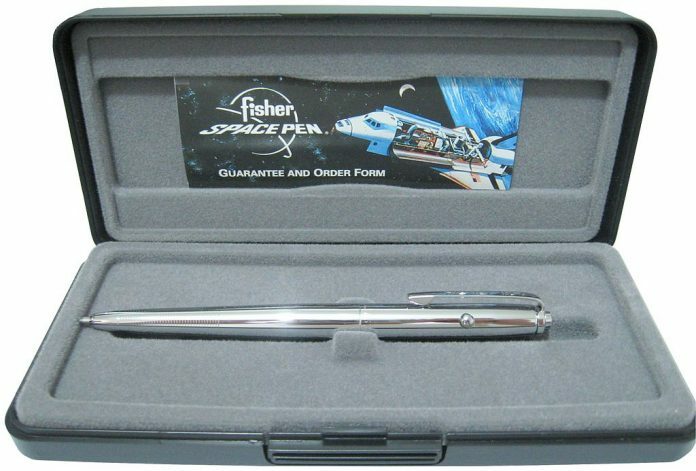 The Space Pen did cost about $1 million to develop, but that money was invested by the Fisher Pen Company. Prior to the pen’s introduction, astronauts used mechanical pencils, and cosmonauts used grease pencils. But both implements were less than ideal (lead, in particular, caused problems if it broke off and started floating around the cabin), so a new writing tool was certainly needed. Paul C. Fisher ran a successful company whose main product was a “universal” refill for ballpoint pens. At the time, most ballpoint designs were prone to leaking, skipping, and drying out. One night, a completely new design occurred to Fisher in a dream, and he went on to build it. This new pen had two main innovations. The first was a sealed cartridge, pressurized with nitrogen to about 40 psi. Because the cartridge was sealed, it would not dry out; the pressure ensured that the ink would flow regardless of the angle at which the pen was held. However, ordinary ink was too runny; the pressure caused it to leak at the tip. So Fisher developed a gel-like ink that was thixotropic, meaning it was semisolid until agitated (by the motion of the rolling ball), which turned it into a liquid just long enough to flow onto the page. This ink, which has a consistency similar to rubber cement, was also waterproof and resistant to smudging. When Fisher presented the final product to NASA, they tested it for months before certifying it as spaceworthy. From 1968 on, Fisher Space Pens have been used on all NASA missions; they’re also used aboard Russian spacecraft. Interestingly, I’ve read a report by one astronaut saying that “ordinary” ballpoint pens work fine in zero gravity after all. Whether this is true of only some designs and not others, I don’t know—but it does make one wonder whether NASA actually tested conventional ballpoint pens in space before deciding an alternative was needed. Be that as it may, Fisher’s design certainly works well on Earth—especially at odd angles that frustrate most ballpoints. It is nice to know that if the need arises, I can write in the rain, on a wall, or what-have-you. However, I rarely use my Space Pen anymore, sad as that makes me. For reasons chronicled elsewhere, I have for decades followed the custom of writing exclusively in purple ink. Sure enough, the Fisher Space Pen company offers refills in purple (and eight other colors). Unfortunately, writing with the purple Space Pen ink is not nearly as smooth as with the black ink (and the purple refills come only in a medium point, not fine point), but more seriously, the purple ink has a strong tendency to bleed when exposed to moisture. That’s right: it can write underwater, but you’d better read quickly, because the purple ink is actually water-soluble! I described this problem in detail (with a photo) in Space Pens vs Purple Ink. The quest for the perfect pen continues. Note: This is an updated version of an article that originally appeared on Interesting Thing of the Day on May 4, 2005.